A breath of fresh air and no knits to spare. Plus an unexpected companion. Lauren Manoogian jumpsuit, The Palatines shoes. Lauren Manoogian jumpsuit, James Rowland sweater, MNZ tee. Manoogian sweater, James Rowland shawl. Lauren Manoogian sweater, Spencer Vladimir skirt. 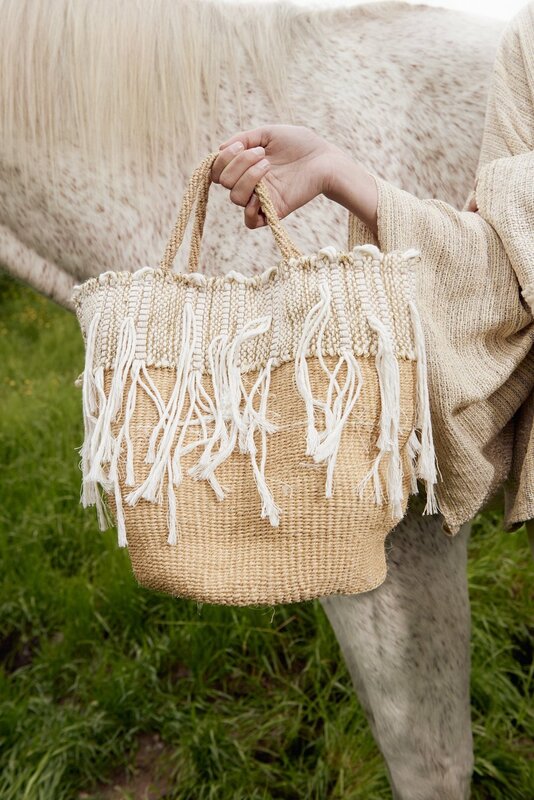 All Roads fringe basket tote. Manoogian sweater, Spencer Vladimir skirt. Callahan knit dress, ARC cuff and earrings. James Rowland shorts, DKNY top. M Patmos sweater dress, ARC cuff and earrings. Lauren Manoogian pants, Spencer Vladimir sweater.